What is CMT Manufacturing in the Apparel Industry? Cut means cutting of garment patterns from fabric role. Make is stitching the complete garment with necessary trims. Trim means trimming of uncut threads tails, cleaning loose thread from the garment after stitching and doing the checking, finishing and packing the garment. 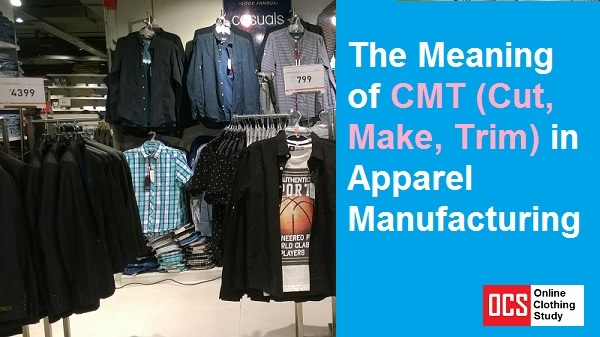 CMT is also a pricing term in the apparel industry. In CMT manufacturing, apparel buyer pays the manufacturers for the cut-make-trim process. Pre-production process like the order processing, product development, pattern making and pattern grading, and post-production process such as shipping of goods are handled by the buyer. In the apparel supply chain, various formats of garment manufacturing exist. CMT is one of the old and still most preferred one for many apparel buyers. When we talk about CMT manufacturing, the CMT garment manufacturers don't buy fabric and trims for the product. Fabric and trims are supplied by the buyer. The factory does not need to go through sample development and other pre-production processes. They just concentrate on production processes. See my other posts on the cutting process, stitching process, and finishing process. You can also download the pdf document that explains garment manufacturing process from fabric to finished garments. Brands can control the fabric quality and product quality. The fabric is costly material. The garment quality depends on the fabric quality and right selection of the fabric properties from reputed mills. Secondly when buyer purchase fabrics from their end, they can save money on the fabric also. Buyers can control the manufacturing and apparel sourcing cost as the fabric is in their hand. They have qualified fabric sourcing team and good relation with the fabric mills. The CMT cost is open to then and manufacturers can charge CMT price and their margin. They can not play on material and overhead pricing. The CMT manufacturers don't need to invest money in fabric and other raw materials. The factory can keep their factory running cost less. In case, factory purchase any trims they can charge their buyer for the same. In terms of earning, CMT manufacturers, they can't charge too much to their buyers as there is no hidden cost of manufacturing and overhead. They are not responsible for the quality issue related to the fabric as the fabric is supplied by buyers. On the other hand, a full package apparel manufacturers (FOB order processing) take care of product development, sampling, production, shipping the garment up to the port (in case of export orders). You might be knowing that most of the big sportswear brands and good domestic brands source their items from CMT manufacturing. Online Clothing Study: What is CMT Manufacturing in the Apparel Industry? What does CMT means in garment sourcing? How it differs from FOB orders.